I actually finished just under the wire on July 28, but never managed a post. Patience is a virtue (at least that's what my mother always says), and that virtue was certainly rewarded during this reading experience. Switzerland's Hotel du Lac was "known as a place which was unlikely to attract unfavourable attention, a place guaranteed to provide a restorative sojourn for those whom life had mistreated or merely fatigued." As the novel slowly unfolds, the history and circumstances of each guest at this luxury hotel is gradually revealed as they go about their daily routines and interactions with one another. The writing is lovely and full of insight. This is my second Brookner novel... I wonder if all are so well- suited to a contemplative mood. Hotel du Lac is a quiet gem! "The beautiful day had within it the seeds of its own fragility: it was the last day of summer." "Good women always think it is their fault when someone else is being offensive. Bad women never take the blame for anything." "In her last months, she lay in bed, wearing the silk peignoir my father bought her on their honeymoon in Venice, not caring, perhaps not noticing, that the lace was torn, the pale blue faded to grey, and when she raised her eyes from her book, her eyes too were faded from blue to grey, and full of dreams, longings, disenchantment. My mother's fantasies, which remained unchanged all her life, taught me about reality. And although I keep reality in the forefront of my mind, and refer to it with grim constancy, I sometimes wonder if it serves me any better than it served my mother." "She knew from the outset what some unfortunates never learn; she knew that the best is there to be taken, although there may not be enough to go round." I have this on the shelf. Thanks for putting the quotes in your review. Lovely writing and I will be getting to this one very soon. Peggy - Enjoy! If possible, try to read it in just a few sittings. This sounds like a beautiful book! Kathy - It's beauty kind of snuck up on me. I always find Brookner rewarding, especially her earlier work. Sometimes I think she has secret access to my journal. Leticia - This is only my second Brookner novel, and I certainly plan to read more. Laughing about your journal remark... she is so insightful. I'm so glad you enjoyed this book. It's sitting on my shelf and I want to read it but I just forget....your wonderful review has prompted me to put it on my nightstand...that should do the trick! I cannot wait to read this beautiful writing. Amy - LOL, the nightstand is usually one step up from the bookshelf for me, too. Hope you enjoy Hotel du Lac! This sounds fantastic - love the quotes you pulled out. Thanks for the recommendation; I'd love to pick it up. AmyMak - I had so many post-it flags sticking out of this book... could easily have included twice the number of quotes! I'm not often in a contemplative mood, and normally don't do well with those types of books. But I have heard wonderful things about this one. 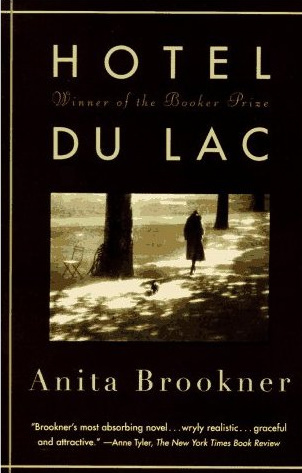 Audrey - I had no idea there is was an actual Hotel du Lac... wonder if it is the inspiration for Brookner's novel. Do you get to visit your sister often? I'd love to see Switzerland! :) so glad you enjoyed it. I've heard how good it is but haven't time to get to it. Thanks for your review and your enthusiasm. I'll definitely keep it in mind. I can assure you that you NEED to be in a contemplative mood to enjoy any of her novels. Thomas - After reading just two of her novels, I have no doubt that's true! I love the quotes you included, so beautiful. I've not read her books yet, but at 192 pages this is tempting to give her a try. Stacy - Yes, this is pretty short. It's probably even better if you can read it in just a few sittings... it took me days to read the first 50 pages! Sounds like Brookner is well worth picking up! So few people seem to like this, but I think it is all about the wonderful quietness she evokes - it is one of my favourites! Vicki - This book sort of snuck up on me. I wasn't enjoying it all that much at first, but was marveling at its beauty by then end!